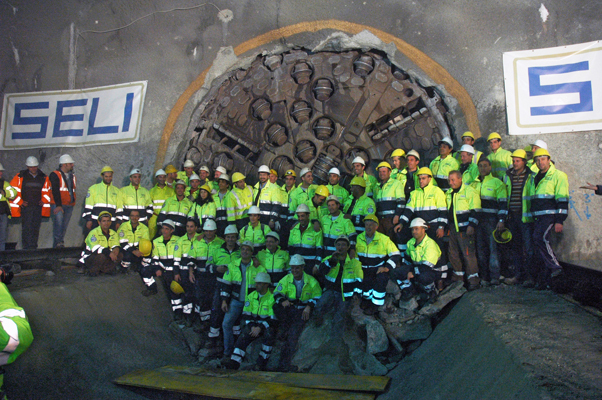 November 3rd saw the breakthrough of the 10.5km long, US$143M Brenner Tunnel exploration bore. Seli, the JV’s tunnelling partner, used a 6.3m diameter Wirth Double Shield TBM to complete the tunnel on schedule in 2.5 years, having excavated through very hard and abrasive 15 – 220MPa Brixen Granite, whilst erecting a 5 piece 200m thick x 1.5m long segmental lining. Actual tunnel construction and lining made up some US$78M of the contract cost. The Austrian-Italian JV consisting of Pizzarotti/Condotte d’Acqua/Seli/Collini/Bilfinger Berger/Alpine Bemo Tunneling/Jäger Bau is constructing the tunnel as vital preliminary works for the planned 62.7km long Brenner Base Tunnel that will link Austria and Italy. The exploration bore is being used to investigate the Brenner Base Tunnel alignment’s rock characteristics, and to provide data and support for its design & construction. The project was awarded to the JV in 2007 by BBT-SE, a European joint stock company, with tunnelling beginning in April 2008 in the presence of the President of the Italian Republic, Giorgio Napolitano. During construction the teams successfully battled extremely asymmetric thrusts, sudden and violent rock bursts, wide faults running parallel to the tunnel axis and groundwater under high pressure. The TBM, which recorded average advance rates of 16m/day will now be dismantled with all finishing works on the tunnel due for completion by February 2011. At 62.7km, the Brenner Base Tunnel will be the longest of its kind in the world, and one of Europe’s largest infrastructure projects, being a part of the Trans Europe Rail Network route 1. Seli has also reported the signing of a US$46M EPC contract in Panama, the second such contract for the company in the country, with client JV Hydro Caisán S.A/ Panama Power Holdings Inc, for the construction of 3.24km long headrace tunnel using a 6.8m diameter EPBM. The contract is part of the larger “El Alto” project, a new hydropower plant under construction in the Province of Chiriquí, in the district of Renacimiento, near Costa Rica. The EPC contract includes, in addition to the excavation and lining of the bored tunnel, the steel lining of last 240m of the tunnel, the construction of surge tanks, a 368m-long penstock, and a piezometric shaft 96m high. Hydro Caisán S.A. has a 50-year franchise for the operation of the “El Alto” hydropower plant. 86.5% of its shares belong to the multinational engineering company, Tahal Group International B.V., with headquarters in the Netherlands. Fully owned by the Kardan N.V. Group, Tahal Group International B.V. is one of the leading companies specialising in water and wastewater systems, hydropower and desalination plants. The “El Alto” project, developed by Hydro Caisán, S.A, will be the next hydropower facility downstream of Monte Lirio. The project will supply a total installed capacity of 60MW and a firm capacity of 24.7MW. Completion of the plant is expected in 2013.